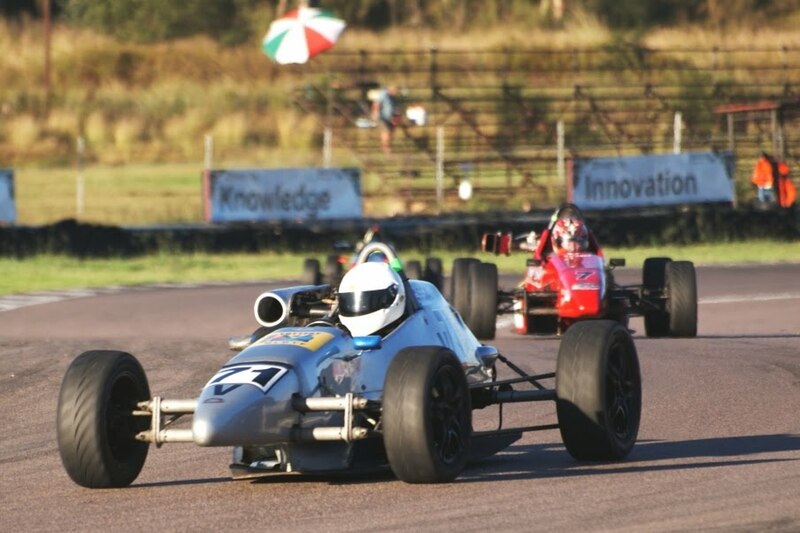 The final round of the Execuline Formula Vee championship held at Zwartkops was to be the arena for the head-to-head championship duel between MSA development driver Zaahir Essa (Reflex Solutions) and ex-champion Peter Hills (Renexcon). Hills lead Essa by 7 points going into the weekend and, to make things more interesting, multiple ex-champion Alan Holm (Office Direct) was making a return to the grid after having been away the entire season. After working through various problems during the practice sessions, Essa was on form and hooked up on the track with his Lotto-provided Rhema 2, qualifying on pole by 0.8 seconds at lap-record pace. The races, however, proved to be a much tighter and dramatic affair. The first heat started off with Essa being pushed wide and off the track, and had to make up lost ground from 4th place to retake to the lead after a few laps. Just after relinquishing the lead, Peter Hills had a mechanical failure and had to anti-climatically pull out of the race. The championship was far from over, though, as Holm and Essa were dicing hard at the front, eventually leading to a coming together at the table-top with 2 laps remaining. Essa was knocked into the gravel and out of the race, with Holm taking the victory from Symm Grobler (Auto Mecca) and Johan Gouws (Indwe). With all still to play for, Essa had to win the second heat to take the championship with both contenders starting from the back of the grid. During the first lap, Essa had to avoid potential accidents, including running off-track, and lost precious ground to what was already a steep mountain to climb. Throughout the 12-lap race, he picked off cars one by one and began to gain on the leaders Holm and Grobler quickly. By the final lap he was right in it, but hard defending from Holm took up all the opportunity Essa had for an attack for the lead and he finished glued to the gearbox of Grobler, the man he had to beat to ensure maximum points. Hills was not out of the woods at the time, and a final tussle at the last corner of the race with Gouws and a curiously-slowing Holm, ensured he overtook both cars and came across the line in third position – enough to take the championship by a single point. The penultimate round of the Execuline Formula Vee championship was held at the legendary Kyalami circuit where title contenders Peter Hills (Renexcon) and MSA development driver Zaahir Essa (Reflex Solutions) needed to make a convincing impression on the points table to hopefully secure what has been an epic 2010 championship battle. At one second a lap under the existing lap record, Hills and Essa fought tooth and nail for the lead of both heats. Essa was clearly suffering from a lack of power as Hills lead most of the laps with ease, but in the closing laps of the first race Essa managed to sneak in front. After a tough duel on the last lap, Hills found his way back in front to take the victory. The second race proved to be a copy of the first, however a slight hold-up with a backmarker in the second last lap allowed Essa to really attack for the lead. After some aggressive defending from Hills, Essa could not avoid him into the final lap and lost his nosecone and brake master cylinder. Despite the lack of motor and brake power, he still found a way to dive past Hills in the final few corners and cross the line in first place. Essa managed to achieve a new lap record at Kyalami with his Lotto-provided Rhema 2 and gained an extra point for his effort, but he still lies a somewhat distant 7 points from Hills going into the final race at Zwartkops on the 16th of October – which still promises to be a great climax to a fiery season. The 4th round of the Formula Vee National Championship was held at the extremely tight and bumpy circuit of Lichtenburg this weekend. Zaahir Essa was sporting redesigned bodywork in the company colours of Reflex Solutions and was out to increase his championship lead. The weekend did not go to plan, however, and Peter Hills (Renexcon) was dominant with stunning pace. Starting from 3rd on the grid, Essa lost places off the start due to clutch problems which worsened throughout the weekend. By the time he had cleared the cars ahead to second place, Hills had already built a strong lead and was romping away. The rest of the heat was uneventful at the front, and Hills crossed the line ahead of Essa and Symm Grobler (Auto Mecca). The second race proved to be a mimic of the first, with Essa again struggling off the start line and losing places. Once he had made his way through, Hills was already well clear and pulled off yet another dominant victory. Even though Essa suffered further clutch problems and was stuck in 3rd gear by the end, he still managed to maintain a gap to 3rd placed Grobler. The once-congested leaderboard has now opened up a little after this round. The top four drivers were separated by just 8 points, but Hills and Essa have pulled a bigger gap going into the next race at Phakisa on the 7th of August, with Hills 2 points ahead. 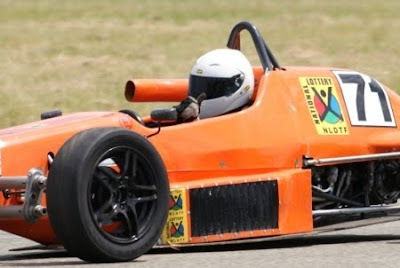 The 4th round of the Execuline Formula Vee championship took place at Aldo Scribante in Port Elizabeth this weekend where the raging championship battle continued with the top four drivers being separated by only eight points. Following through from his previous successes this season, MSA development driver Zaahir Essa (Reflex Solutions) put his Lotto-provided Rhema 2 on pole position for the first heat. After initially fighting with ex-champion Peter Hills (Renexcon), Essa stretched out a healthy lead before succumbing to the inevitable tyre degradation on the abrasive track surface. Nicholas Tennant (Tennant Life Benefits), the only driver to use his second set of new tyres of the three allocated to each driver for the season, reeled Essa in with 2 laps to go. After a thrilling duel, Essa managed to maintain his lead to the finish by just one tenth of a second. The second heat proved to be an even tighter match. Throughout the 14 laps, Essa held off the relentless challenges from Tennant by not putting a foot wrong and placing his car in the right places at the right times. Lap after lap, Tennant would try everything he could, but Essa kept a cool head and used his tactical experience to cruise to yet another double victory. Although Essa missed the start of 3 heats this season, he has been able to win every other race so far which pushes him into the lead of the championship from fourth position, with four rounds to go. Execuline Formula Vee heads to Lichtenburg on the 3rd of July. 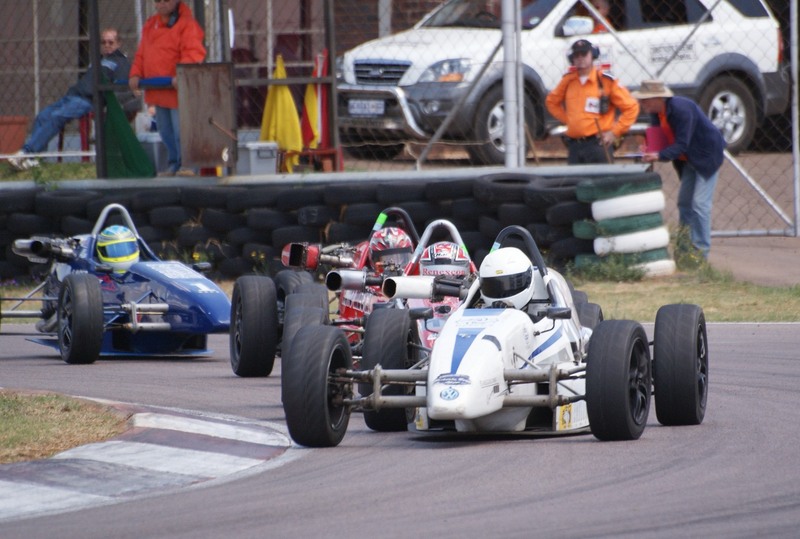 Zwartkops was host to the 3rd round of the national Formula Vee championship this weekend, which provided action-packed racing once again. The highlight, however, was the performance of Motorsport South Africa development driver Zaahir Essa (Reflex Solutions) who experienced the highs and lows of motorsport in one day. Essa, in the Lotto-provided Rhema 2, was full of confidence after his double win in the last event, but was let down with engine failure in qualifying just after having posted a laptime quick enough for pole position. Without a spare motor, he was forced to use his older Rhema 1. Unfortunately due to the car not being at the track or even race-ready, Essa was only able to join the first heat a few laps into the race. Essa started the second heat from the back of the grid, and really showcased his current stunning form. Immediately off the start-line and during the first 3 laps, Essa attacked hard and made up positions in just about every corner, unbelievably crossing the line in 4th position. 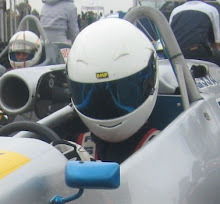 He then set his sights on the lead pack of Symm Grobler (Auto Mecca), Peter Hills (Renexcon), both Ex-National Formula Vee Champions, and third placed man Trevor Bland. Setting consecutive fastest laps to reel them in and after dispatching Bland and Hills in two corners, Essa took the lead from Grobler with a little over 4 laps to go and maintained this position to the finish. Essa now stands 4th in the championship, with five rounds remaining. Formula Vee heads to Aldo Scribante in Port Elizabeth on the 8th of May 2010.